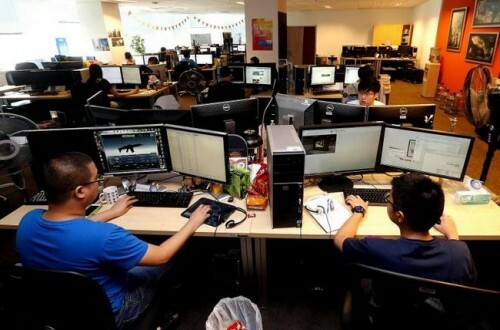 SINGAPORE - Ten companies, both multinational and local, were recognised as the best technology companies to work for in Singapore on Wednesday. The award, organised by the Singapore Computer Society (SCS), aims to honour technology companies here which have strong talent development and corporate culture. There were four winners across three categories: Large organisations or multinational companies, mid-sized organisations, and start-ups. There was a tie between software giant Microsoft and game developer Ubisoft in the large organisation category. Ubisoft Singapore's managing director Olivier de Rotalier said: "This accolade is a strong endorsement of our efforts in creating the right environment for our staff to learn, grow, innovate and excel in developing unique and memorable gaming experiences for players around the world." JustCommodity, which develops commodity management software, was the winner in the mid-sized organisation category, while mobile security firm Treebox Solutions nabbed the prize in the start-up category. The firms were judged on five criteria, such as innovation, human resource management and development, people culture and financial sustainability. The other six finalists were Adventus Singapore, CommGate, LinkedIn Corporation, Paywhere, Red Hat and Tagit.